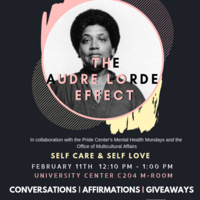 Join us in collaboration with the Pride Center’s Mental Health Mondays for a conversation on caring for oneself, self-preservation, affirmations, and tips on self care techniques. Enjoy an hour of crafts, coloring, and dialogue. Refreshments will be provided, feel free to bring your own lunch!